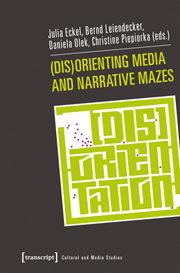 Welcome to the web-page of the conference “(DIS)ORIENTATION – (dis)orienting media and narrative mazes“, which took place at the Ruhr-University Bochum from November 10th to November 11th 2011. The focus of this conference lay on media as technologies and sites of orientation and disorientation as well as media narratives employing this (dis)orientation as theme and structure. You will find further information concerning the topic, program and organisation of the conference on the following pages. Coming soon: our conference volume! It will be published in English in December 2012 by transcript. For further information see here or here.